As the expression goes, hindsight is 20/20. Think back to most major accomplishments in your life and ask yourself, if you knew at the beginning what you knew when you reached your goal – how would that have changed your journey? For most of us, it would have meant a less bumpy road, right? And with that in mind, we present you with Elevate Fitness’s gym tips for beginners. Tip #1: Remember that Rome wasn’t built in a day. It’s going to take time to reach your fitness goals, and more importantly, it’s probably going to take some time before you even start to notice progress. Think about it this way: one workout isn’t going to magically get you into shape just like it wasn’t missing one workout, or spending one lazy day on the couch that got you out of shape in the first place. If you start your journey toward fitness with the expectation that you’ll see big results fast, you’re going to end up disappointed and back on the coach. The best way to avoid this is to be realistic about both your goals and the program you’re going to use to achieve them. Consider sitting down with a personal trainer or fitness coach to discuss what you hope to achieve. Not only will it help you decide on the best action plan to meet your goals, but you’ll also have a better understanding of what you can expect to see happening when. Not only is this a good way to start your fitness journey, but most gyms, including Elevate Fitness, want you to do this so they’ll give you a complimentary training session when you join! Tip #2: Take group fitness classes. We cannot emphasize this enough. When you walk into a gym for the first time and see the sea of equipment laid out for your use, keep in mind that depending on your exercise experience and your goals, not every piece of equipment is the right piece for you to be using. Not only that – it’s highly unlikely that without instruction you’ll be able to use the equipment properly on your first try. Instead of throwing yourself at the machines (which are likely to slow your progress, see tip #1) consider taking a group fitness class where you’ll have an instructor providing you with a proven program, real-time coaching and helping to keep you safe to minimize your downtime (recovery) between workouts and increase the effectiveness of your workouts getting your noticeable results more quickly! Think classes aren’t for you? Well if you immediately imagined a bunch of women in leotards with perfect makeup and hair bounding along to some great 80’s music (yes, we said 80’s music is great and we stand by that) then you need to see how group fitness has evolved. It’s now more inclusive on all fronts and less dance-driven and much more athletic in nature. 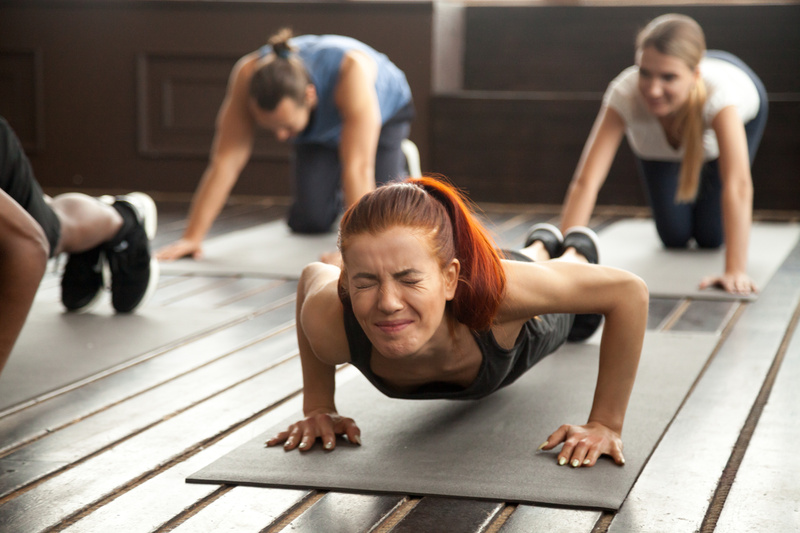 Check out our fun post on The Evolution of Group Fitness Classes. Tip #3: Create playlists that will get you pumped up (no pun intended) for your workout! Don’t underestimate the motivating power of the Theme from Rocky or Journey’s Don’t Stop Believing when you’re in the gym. And it’s not just a crazy idea that music can help you power through a tough workout or finish your cardio strong – there’s actual science to back it up! In 2012, Psychology Today published this intriguing article about The Neuroscience of Music, Mindset, and Motivation. In fact, looking back at Tip #2, motivating music is one of the key components of effective group exercise classes in keeping participants motivated and coming back for more. Ask any Spin Instructor (we’re looking at YOU Lisa Dolbear) who’s spent hours pouring over the perfect playlist how important song choice is in creating the perfect workout, and they’ll consistently rank it among the most important factors of a successful class. Tip #4: Don’t overestimate how hard you’ve worked out at the gym when you get into the kitchen. Often, when people become newly active at the gym, they convince themselves that they need an additional reward in the kitchen to offset all the hard work they’ve been doing. Research has shown that people, when guestimating, often overestimate the number of calories burned during a workout. Our suggestion for avoiding this fate? Math. Track how many calories you’re burning and how many calories you’re consuming. But how, if guestimations are so often wrong? Simple: invest in a heart rate monitor. You’ll get pretty accurate data concerning your calories burned during a workout (not exact, but a lot more accurate than a guestimate) that will allow you to plan your calories in (based on your unique goals) with a lot more accuracy. Honestly, we’re obsessed with heart rate training and would never consider putting ourselves through the effort of working out without one because it’s honestly the best way to get real-time feedback about the effectiveness of your efforts in the gym. Read our post on Why Heart Rate Monitors Are the Most Important Thing You Can Buy to Achieve Your Fitness Goals and then check out some of the heart rate monitors available at Elevate Fitness (although you can use any ANT+ compatible heart rate monitor at Elevate Fitness). Tip #5: Make friends. And if you’re not good at making new friends – bring an old one with you! There’s power and safety in numbers. And that applies to your gym life, as well. There’s power in community and the old adage that none of us is as smart as all of us applies to your fitness goals. Even the top athletes in the world work with personal trainers and coaches. And a lot of them train with teammates or other athletes because the power of many is so much strong than the power of one. Not only is it motivating, but you’re likely to increase your “fitness vocabulary” and “library of exercises” by working out with a buddy or two. And always having a spotter available will keep you safer, too! Looking to make new gym friends? See tip #2 – group fitness classes are a great way to meet new friends. Want to bring an old friend? Most gyms (including Elevate Fitness) have referral programs. Not only can you usually get a guest pass for a friend to try out the gym with you, but most clubs (at least the good ones) will reward you if your friend joins! At Elevate Fitness you’ll earn 500 rewards points that can be spent in our online Rewards Store! So whether you’re an absolute beginner, or if you’re just beginning again – apply this advice to your fitness journey, and we’re confident that you’ll experience results, enjoy the process more and maybe even create a lasting lifestyle that allows the rest of your life to truly be the best of your life. Need a place to begin? Try Elevate Fitness for FREE!